There are so many things that could finish this title. First things that comes to mind is My Big Fat Crazy Family. (But I'm sure many bloggers could say the same thing). I'm tellin' you my family is a crazy group of people. First there's Dad, who is ultra reserved until Coors Light shows up, which turns Dad in to a fun loving, joke crackin', "what'd you say? ", kinda guy. He often has many moments of forgetfulness too. You can tell him something one minute, and two minutes later he'll have totally forgot what you said. Third is me. And I already know that I'm a nuthead. I'm ultra controlling, things have to be done my way or no way. (Which is something I'm working on desperately to fix). I'm also very silly and stupid. Andy hates it, but I always talk in weird voices or constantly quote from movies. Finally is Chris, my younger brother. He's always making up these crazy inventions. We used to have a big huge trampoline outside called, The Tramp. Well Chris came up with this crazy idea to take the wheels off his bike and put padding all over the frame. He then proceed to use the padded bike to do flips and tricks on The Tramp, kinda like a motorcross rider does tricks off a dirt ramp. But, I guess every family has their crazy stories. With those stories come some of the fondest memories, hardest laughs and face streaming tears. And there is no way I would trade my crazy family for anything in the world. 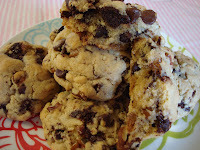 However, of all the things that I could use to complete the My Big Fat title , I would say that My Big Fat Chocolate Chip Cookie would have to be the best choice! Months ago I watched Bobby Flay throw down with Levain Bakery, and I was star struck. These cookies from Levain were the biggest cookies I had ever seen. I slowly started seeing copycat recipes pop up and finally decided to give them a try. 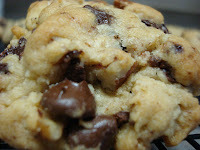 I used this recipe from Cookie Madness, but made one small change. 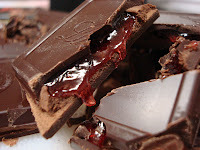 I found a Lindt chocolate bar that had a cherry chile filing, so I chopped that up and substituted it for half of the regular chocolate chips. I cannot tell you how good these were! 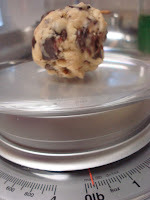 Each cookie is 4 ounces, which you can see from the picture. 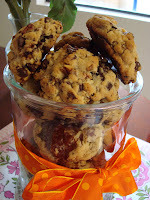 They were so big that the 12 cookies were overflowing out of my cookie jar. I'm sure this shouldn't be a problem though seeing as I don't think they'll last very long. So here's to many Big Fat things in our lives that end up being the greatest blessings (in disguise). Your cookies look great! Don't you love Lindt chocolate? It's kind of fun experimenting with different types of chocolate. Also, if you like peanut butter, the Levain chocolate cookies with peanut butter chips are very good.